ww2dbaseFritz Erich von Manstein was the tenth child of the aristocratic artillery officer General Eduard von Lewinski and Helene von Sperling. Upon his birth, he was given for adoption by his childless uncle Lieutenant General Georg von Manstein; "You got a healthy boy today", said the Lewinskis via telegraph. "Mother and child well. Congratulations." The adoption was officially recorded in 1896 upon the death of Eduard von Lewinski. In addition to his biological and adopted father as military men, two of Manstein's grandfathers had also been Prussian generals, as well as his mother's brother. It was expected of him when he joined the cadet corps in 1900, and became an ensign in the Third Foot Guards Regiment's Fusilier battalion in Mar 1906. He attended the War Academy in 1913, and upon the completion the following year he was promoted to the rank of lieutenant. During WW1, Manstein served on both fronts. He was wounded on the Russian front in Nov 1914, and became a staff officer after his recovery for the remainder of the war. ww2dbaseDuring the interwar years, Manstein participated in the creation of the Reichswehr, followed by his promotions to lead army units as large as a corps by the end of the 1920s. In 1936, he stood shoulder-to-shoulder with fellow brass with the promotion to the rank of major general, and the assignment of Deputy Chief of Staff to General Fedor von Bock. As WW2 drew near, von Manstein was among the officers who oversaw the annexation of Sudetenland under the command of General von Leeb, although he did not believe Germany had the capability to defeat the Czech army should the Czechs decide to defend her fortifications on the German border; "we did not have the means to break through", he said. ww2dbaseDuring the two world wars, he was instrumental in the backing of developing a self-propelled heavy field gun to support the infantry. The resulting StuG series assault guns was not only one of the most effective infantry support weapons in WW2, but it also freed tanks from this mundane task. ww2dbaseDuring WW2, Manstein, now a lieutenant general, served as Chiefs of Staff to Gerd von Rundstedt in the Poland and France campaigns. In these two campaigns that formally drew Europe into a war, von Manstein was known for his successful coordination of air and ground forces. In Poland, Manstein's plan leveraged the mobile capabilities of Walther von Reichenau's armor to encircle the unprepared Polish forces. In France, his maneuvers through the Ardennes to outflank the Maginot Line were a major reason for the western nation's quick fall. After the surrender of France, he was promoted to a full general and on 19 Jun 1940 awarded the Knight's Cross. ww2dbaseManstein's attack plan across the Ardennes was developed together with Colonel Günther Blumentritt and Henning von Tresckow, and it was nicknamed Sichelschnitt, or, sickle cut. It was later referred to as the Manstein Plan. ww2dbaseIn Feb 1941, Manstein was given command of the newly formed 56th Panzer Corps of Panzer Group 4 of Army Group North, with which corps he participated in Operation Barbarossa. He made a significant 100-mile advance during the first two days of the operation. In Sep, he received command of the 11th Army of Army Group South and participated in the Crimea campaign, taking over 430,000 Russian prisoners as he conquered all of Crimea with the capture of the Black Sea port of Sevastopol on 1 Jul 1942. On the same day, he was given the honor of the title Field Marshal. Later that month, Manstein's 11th Army was sent northwards to join Army Group North to capture the city of Leningrad. At Leningrad, the back-and-forth frontlines cost 60,000 casualties on Manstein's army, but it also marked his brilliance in that his smaller units regularly outmaneuvered larger Russian forces. In Nov 1942, he was placed in charge of Army Group Don consisted of a hodgepodge of German and Romanian elements, and placed in charge of rescuing Friedrich Paulus' troops in Stalingrad. This operation to Stalingrad, code named Operation Winter Storm, was launched on 12 Dec. After meeting continuous fierce Russian resistance at Stalingrad, Manstein reached as close as 35 miles to Paulus but was stopped by a series of Russian counterattacks. At this point, he asked Berlin to order Paulus to break out of their encirclement in the city, but Berlin refused to issue such an order, citing Adolf Hitler's wishes that Stalingrad must be occupied at all costs. Manstein was finally driven into a withdraw back to Ukraine, but he was also credited for avoiding the complete collapse of the eastern front for the Germans after the demoralizing loss at Stalingrad. He regrouped and launched a renewed offensive against the Russian forces at Krasnograd, causing 30,000 casualties amongst the Russian troops, of which 23,000 deaths. ww2dbaseFeb 1943 saw Manstein's appointment as the head of Army Group South, which was consisted of the remnants of Army Group B and Army Group Don. On 21 Feb, Manstein launched a renewed attack into Russian lines, with fast-moving armor cutting off Russian troops. By 9 Mar, large quantities of Russian tanks and artillery guns were captured, in addition to causing 23,000 casualties and capturing 9,000 Russian soldiers. On 14 Mar, the city of Kharkov was captured after brutal street fighting; for the victory at the Third Battle of Kharkov he was awarded Oak Leafs to his Knight's Cross. On 21 Mar, the 2nd SS Panzer Corps under his command captured Belgorod. ww2dbaseDuring Operation Citadel which saw some of the biggest tank battles in the war, Manstein launched a pincer attack against the Russian-held city of Kursk, defended by Georgi Zhukov. Manstein's northern pincer, led by Günther von Kluge, failed to achieve its objectives. This slowed down the operation and gave Zhukov an opportunity to launch fierce counterattacks. In Berlin, Hitler decided to call off the German operation at Kursk, despite Manstein's protest, after the successful Allied landing at Italy. Manstein, at the face of Russian counter counteroffensives, retreated west of the River Dnieper, but not before inflicting heavy casualties on the Russian Army with a counteroffensive of his own. ww2dbaseBy Jan 1944, Manstein was generally holding ground but he knew there was little chance Germany could maintain the Eastern Front for much longer. He was deeply committed in several strategy disagreements with Hitler, whose belief that every inch of ground must be held conflicted with von Manstein's favor for a mobile war. Von Manstein believed that territorial losses were acceptable if it meant the opportunity for mobile German forces to surround the stretched Russian lines. Hitler was outraged at Manstein's suggestions that the Fuhrer was inadequate as a military professional, but continued to compromise with von Manstein due to the general's proven capabilities. On 30 Mar 1944, the egotistical Hitler was persuaded by Göring and Himmler to dismiss Manstein. "He was not only the most brilliant strategist of all our generals, but he had a good political sense. A man of that quality was too difficult for Hitler to swallow for long", said Blumentritt. To appease the able general, Hitler also approved the award of Swords to Manstein's Knight's Cross with Oak Leaves on the same day as the dismissal. To the inner circle in Berlin, this dismissal did not come as too great of a surprise, for that Hitler feared Manstein to a certain degree because of the very capability that he held in his hands; Hitler simply felt threatened by such an able general. Manstein retired from the army and retired to western Germany. ww2dbaseWhen Germany surrendered, Manstein surrendered to British General Bernard Montgomery and was placed under arrest on 23 Aug 1945. He was housed in a POW camp in Luneberg, and later transferred to Nüremburg where he was called as a witness for the defense to clear the name of fellow military leaders of war criminal accusations. In Aug 1949, he was found guilty of war crimes and was sentenced for 18 years of imprisonment. He was treated with favor by the British; this was a result of both the British respect his integrity as well as an open rejection of the Russian demands that the German be sent to Moscow for a separate trial. The trial cleared him of many charges, but was still found guilty of employing scorched earth tactics and failing to protect civilian population. He was released from prison on 6 May 1953, before the scheduled end of his 18-year prison term, for medical reasons (eye problems). He became a senior advisor to the German government on anti-Soviet initiatives during his retirement, and published his memoirs under the titles Lost Victories and From a Soldier's Life 1887-1939 in 1955 and 1958, respectively. 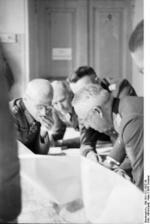 In Lost Victories, Manstein expressed his deep belief that had the generals controlled the military matters, instead of Hitler, the eastern front could be won by that Germans. ww2dbaseErich von Manstein passed away in Irschenhausen, Bavaria. He now rests eternally in Dorfmark. He left behind a legacy of being one of the ablest German generals of WW2, defeating numerically stronger Russians with superior maneuvers. Erich von Manstein and his wife Jutta Sibylle von Loesch had three children; his oldest son, Gero, was killed in battle on the Eastern Front in Oct 1942.
ww2dbaseSources: Achtung Panzer, DHM, In the Service of the Reich, Spartacus Educational, Wikipedia. 24 Nov 1887 Erich von Manstein was born. 21 Oct 1939 General Erich von Manstein, Chief of Staff of Army Group A, obtained a copy of Plan Yellow whilst passing through Berlin, Germany on his way to set up Army Group A Headquarters at Koblenz. He found little to admire in the plan, considering it to be too much like the strategy of 1914, and even predicting that the advance would bog down at the same place – on the Somme River in France. 17 Feb 1940 As it was customary for new corps commanding officers to dine with the Führer, Hitler's aide Colonel Schmundt arranged such a meeting for Hitler and Manstein. Manstein presented his plan for the invasion of France and the Low Countries, which impressed Hitler. 12 Aug 1942 Erich von Manstein was transferred from the Caucasus area of southern Russia to the Leningrad area of northern Russia. 6 Feb 1943 Adolf Hitler met with Erich von Manstein at Rastenberg, East Prussia, Germany. The Field Marshal had been flown 900 miles from Donetsk, Ukraine to the Führer's Wolfsschanze headquarters in Hitler's personal Focke-Wulf Fw200 V3 "Immelmann III". At the four hour conference, only five days after the surrender at Stalingrad, Russia, the Army Group South commander persuaded Hitler to allow him to retreat to the River Mius. 11 Jun 1973 Erich von Manstein passed away. I think he was the most genius and brilliant tactician ever, or at least in World War 2.
what was von Manstein's rank in 1935 specifically?